Fender. The name conjures up a whirlwind of thoughts and emotions in musicians around the globe. More than simply one of the foremost makers of guitars and amplifiers, Fender exuberates the spirit of rock and roll. One can hardly imagine the Fender electric guitar being absent from rock's rich and colorful history. Logic tells us that if Fender guitars weren't around, the rock revolution would still have occured. But boy are we glad that Fender was there along for the ride. As is so often the case in history, the vision of one humble inventor gives birth to a phenomenon so powerful and full of impact one can hardly imagine a time when that invention didn't exist. What Leo Fender did for the guitar industry (and by extension the music industry) in the 1940s and '50s was amazing. By making the Fender Telecaster the first solid-body electric guitar to be made in mass production, he changed the landscape of guitar making forever. 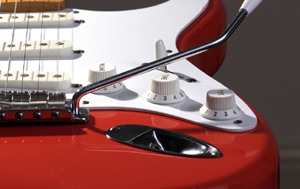 So innovative was this manufacturing technique that many called Leo Fender the Henry Ford of musical instruments. With the addition of the Precision Bass guitar in 1951, Fender took another musical leap forward. No longer limited to the subdued nature of the acoustic bass, bass players were able to plug in and be heard. The Fender electric guitar and Fender bass proved to be a formidable combination, laying the foundation for what is commonly called the modern rock combo. You didn't need a 20-piece orchestra to be heard anymore. Two or three musicians could get together and make music for all to enjoy. Of course, no article about Fender guitars would be complete without mentioning the Fender Stratocaster. For most, the iconic Stratocaster is the pinnacle of the electric guitar. Combining an innovative design with improved functionality, the Stratocaster was adopted by musicians everywhere for its versatility, sound and playability. Leo Fender went on to create new products such as the Esquire guitar, Jazz Bass, Jaguar guitar as well as acoustic guitars and amps. During later times when Fender's creativity and production slowed, their popularity was as strong as ever. And during more modern times Fender has regained its stature (although one could argue it was never lost) as the top name to meet every guitar player's needs. From the guitars themselves to strings, accessories, mixing boards, amplifiers, Fender has it all. From die-hard musicians to casual radio listeners, the Fender guitar has affected us all. Rock and roll, country, blues and beyond, Fender has become part of almost every music landscape. To that we say thank you, Fender, thank you.